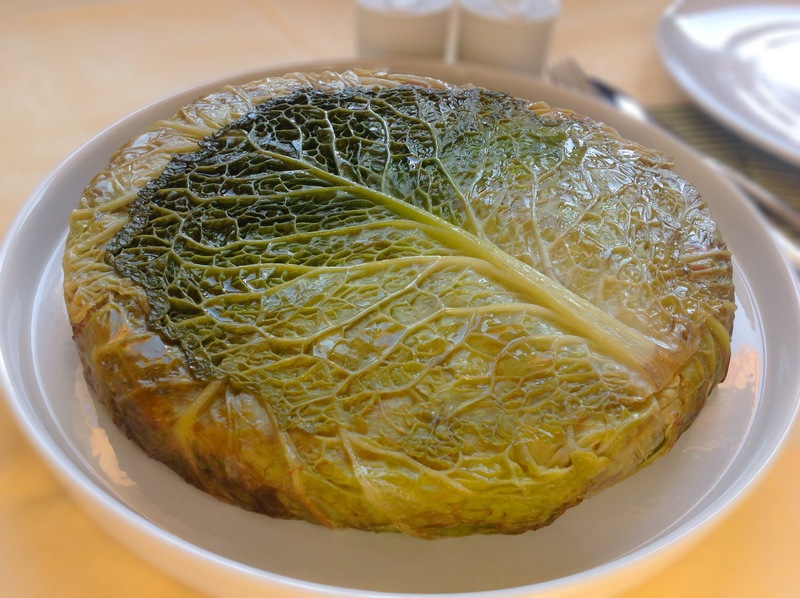 As Maltese, we are used to ‘Bragioli tal-Kabocci’, which are Cabbage Rolls, usually stuffed with meat and then roasted in the oven with baked potatoes. This time, instead of making individual rolls, I made a cabbage and beef pie. 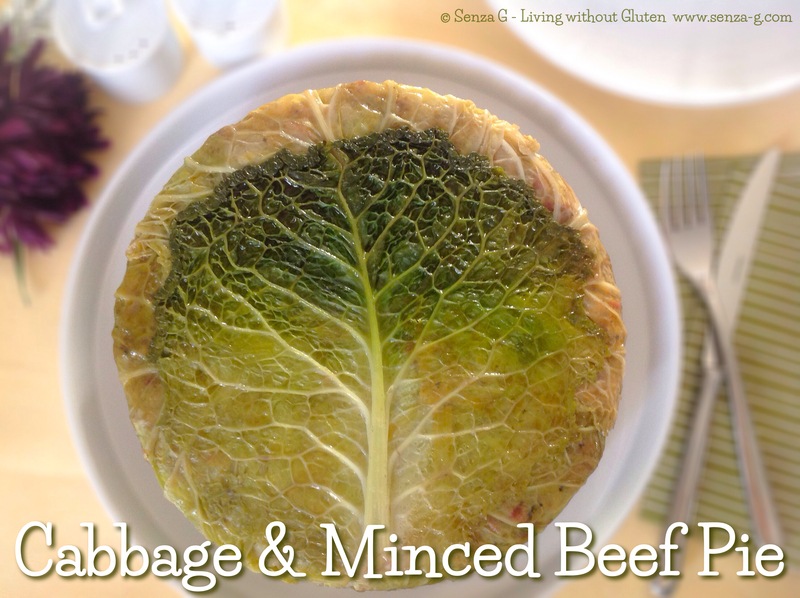 With a little patience and clever layering of cabbage leaves, the pie can turn out to be quite pretty. 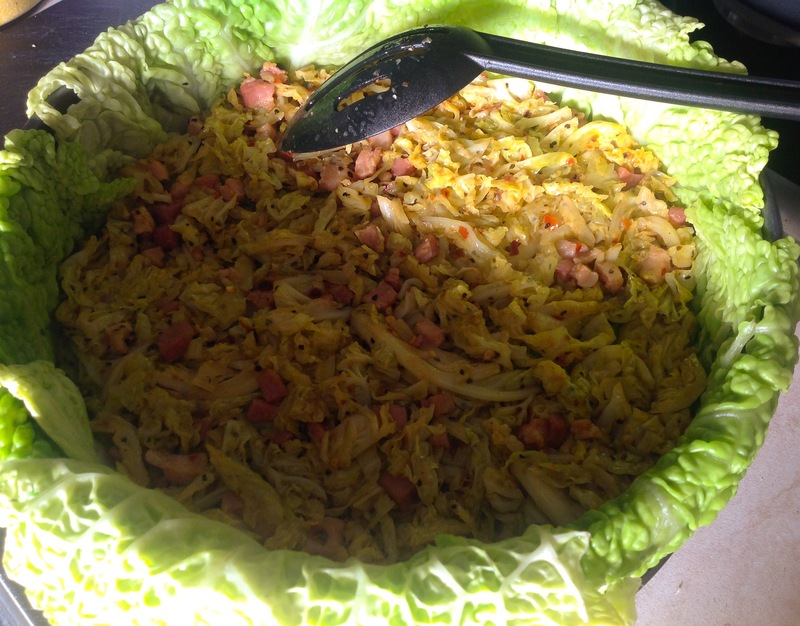 It is also made up of two layers, one with the heart of the cabbage, shredded and stir fried with pancetta and onions and the other layer is with mince meat, sausage meat and rice. You can either make it with minced beef and rice only or another idea is to use Maltese Sausage instead of Italian Fennel Sausage, giving it more of a coriander taste than a fennel one. Do not add salt however as Maltese Sausage tends to be quite salty. The pie is then baked for about an hour. Start by cooking the rice for the meat filling, place 1/2 cup of rice in a fine-mesh sieve and rinse under cold running water until water runs clear. Drain well. Bring the rice, pinch of salt and 1 cup of water to boil in a small or medium saucepan over high heat. Reduce heat to medium-low, cover and simmer until rice is almost done, 10 minutes. Allow rice to cool slightly. Place the whole cabbage in a large pot of boiling salted water. Cook just long enough to soften leaves. Drain in a colander, keeping the water in another pot, and cool under cold running water. Carefully remove the leaves without breaking them. Choose the best large cabbage leaves, about 7 to 8 and set aside. Cut thick ribs from the other larger leaves, except the largest and best looking leaf, in which case, just slice a bit off the thickness of the stem. 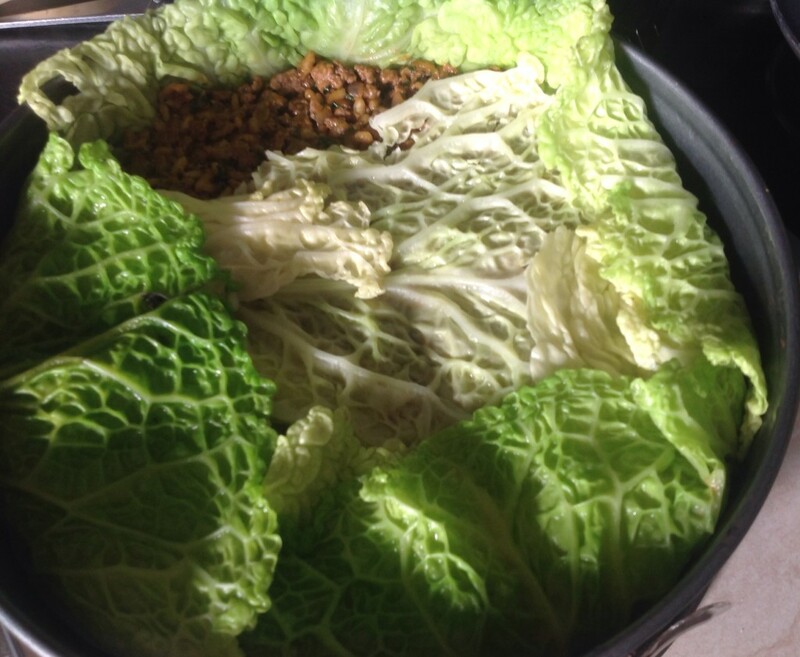 Boil the quartered cabbage heart in the reserved water until just tender. Drain well, remove the hard stems and chop. In a pan, heat a little olive oil, add the chopped onion and when that becomes translucent, add the pancetta cubes. Add also the shredded cabbage, season and fry for a few minutes stirring well. Set aside. 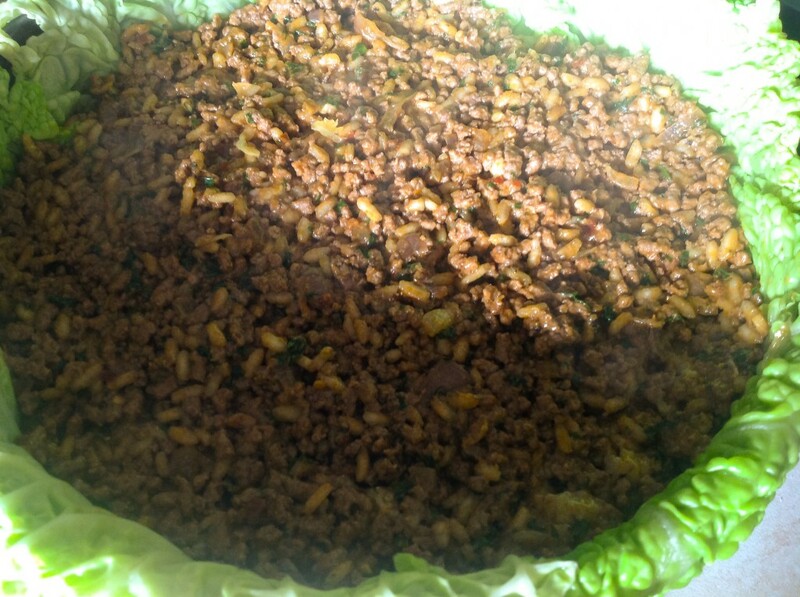 To make the meat filling, heat oil in a frying pan over medium-low heat. Add the onion and carrots and fry until soft, about 7 minutes, add the beef and the fennel sausage meat and cook until browned. Add the garlic, the spices, a dash of red wine, the stock, parsley and season with salt and pepper. Combine well. Cook for a few more minutes, remove from the heat, stir in the boiled rice and grated cheese and set aside. 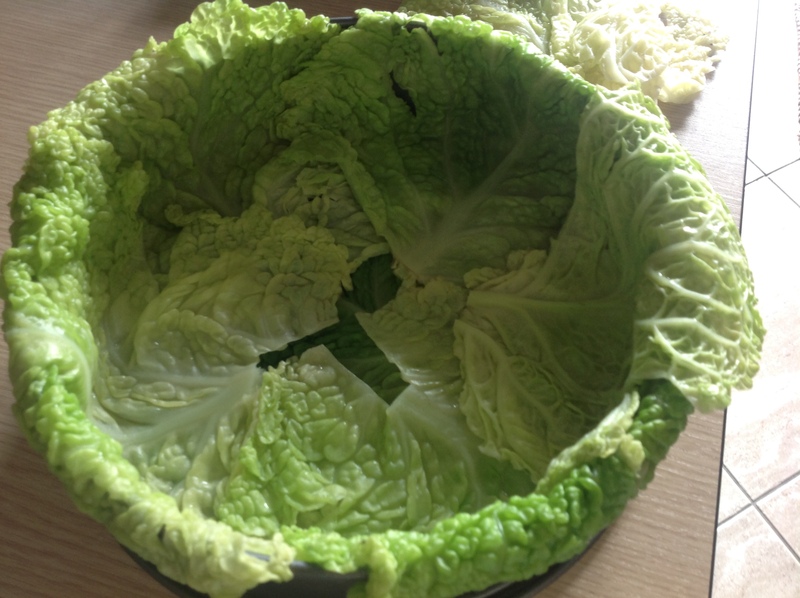 Oil a spring release round tin and place the best looking cabbage leaf at the bottom. Using the remaining large leaves, line the tin and up the sides as in the photo. They should overlap, ‘fan’ out and slightly overhang. Put the shredded cabbage and pancetta mix at the bottom, i.e. on top of the cabbage leaves, and level. Now put the beef and sausage mixture on top of the leaves, leveling it as well. Fold the cabbage leaves over the filling, using extra leaves to completely enclose the filling. Place a plate on top and slightly press down to compact it. Remove the plate. Place little pats of butter over the top and put the cabbage pie in the oven. Cook for approximately an hour. Remove from oven. Leave to rest and to cool slightly. Release the ring, place a large plate or round dish over the cabbage pie and flip the dish over. Be careful when doing this as some juice might come out of the pie which will be very hot. Carefully remove the base of the pan. Your first cabbage leaf which you placed at the bottom should look like a tree with branches. 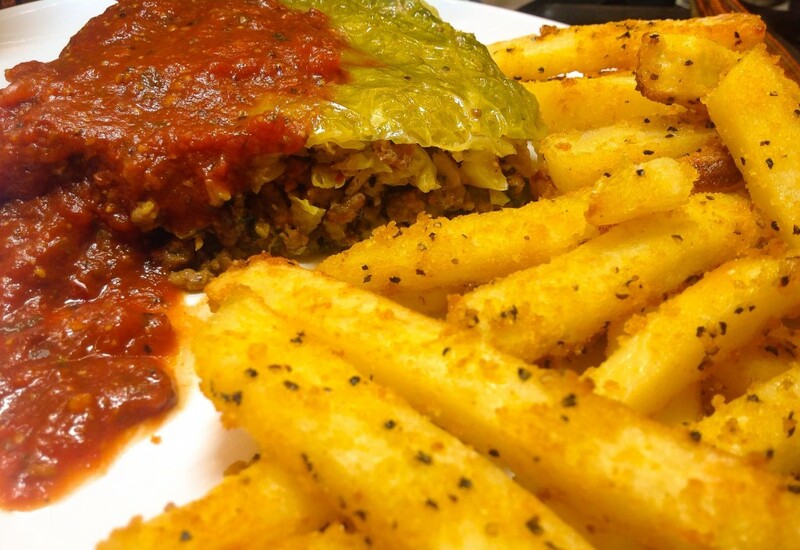 You can serve this cabbage pie with fresh tomato sauce and home made chips.